Howard Carter was born on 9 May 1874. He was the one who discovered the intact tomb of the 18th Dynasty Pharaoh, Tutankhamun in November 1922. Carter passed through very hard three years until he was chosen to be the leader of the excavating team in Deir El-Bahri by Lord Carnarvon. Then he moved in 1914 to lead the excavation team in Valley of the Kings but his work was interrupted with the First World War and he resumed his work in 1917. The water boy in Carter’s team accidentally stumbled on a stone that turned out to be the top of a flight of steps cut into the bedrock On 4 November 1922. 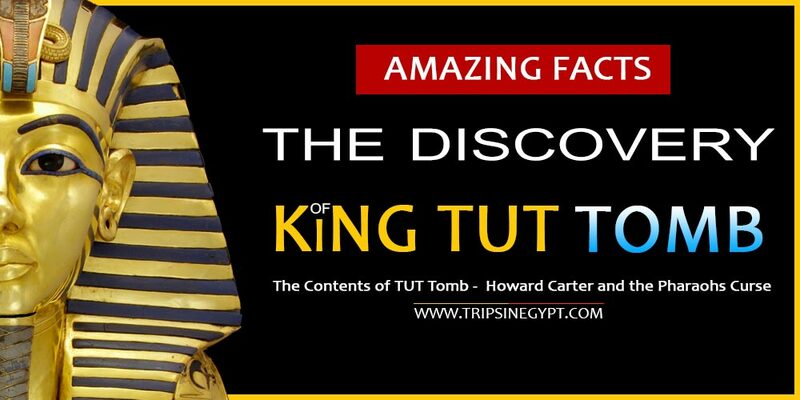 This led Carter to discover the doorway of Tutankhamun tomb. Howard Carter received in 1926, the Order of the Nile, third class, from King Fuad I of Egypt. He retired from his work after discovering this tomb and became a part-time agent for collectors and museums. He died in London on 2 March 1939 at the age of 64 from Hodgkin’s disease. Tutankhamun was the pharaoh of the 18th dynasty during the New Kingdom. Although he died in his early life, he has a very astonishing history, full of actions of brave, confidence, and royalty. He was called Tutankhaten that means the liming image of Aten but when he started to worship Amun he changed his name to be the Tutankhamun “The living image of Amun”. Tutankhamun reigned for about ten years. He was the son of Akhenaten and he reached the throne after his father’s death when he was only nine or ten years old. He married Ankhesenpaaten and was about to get two children from her but suddenly both of them died without a clear reason before coming to life. There are many wonderful accomplishments of Tutankhamun including ending the worship of Aten and praised Amun. At Karnak, he established many memorable buildings and he tried to change the economic state of his country by establishing strong relationships with his neighboring. Tutankhamun had some characteristics from the Thutmosid Royal line as he suffered from Klippel-Feil syndrome in addition to deformations in his left foot, which were caused by necrosis of bone tissue. Because of his sudden death, workers hurry to build a tomb for him and the consequences from this was a small tomb that doesn’t fit a royal pharaoh like him. The items that were found inside the tomb made him the most famous one among the other Egyptian pharaohs that included about 5,398 items including a solid gold coffin, thrones, food, wine, sandals, fresh linen underwear, and many other amazing items. The most notable thing among those items was his golden mask “The Death Mask” that was decorated with inlays of colored glass, lapis lazuli plus other terrific gemstones and was made especially for pharaoh Tutankhamun upon his death. Tutankhamun suffered from Malaria and had a rare bone disorder called Köhler disease that caused his left foot to be deformed. He also used about 130 sticks to walk during his lifetime and they were buried with him after his death. The main reason for his death may be his knee after it was broken and caused massive bleeding. He had a fatal leg fracture that may cause his sudden death. Tutankhamun tomb is located in the Valley of the Kings on the west bank of Luxor where you can visit it by Nile cruise holidays, its items have been transported to the Egyptian Museum. To reach the tomb, you have to get down 16 steps to a descend doorway. Through the entrance corridor, you will find yourself in the antechamber just what Howard Carter described, which was in a state of “organized chaos” because of the ransacking during the robberies. Tutankhamun tomb contained approximately 700 objects. Among those things, there were; three funeral beds, components of four chariots, and a large chest of military items. The burial chamber in the tomb was the only one that was decorated and if we want to speak about the contents of the tomb, you’ll need a separate section. Inside Tutankhamun tomb, there are four glided wooden shrines. The outer golden shrine, which is now displayed in the Egyptian Museum, measured 5.08 x 3.28 x 2.75 m and 32 mm thick. Tutankhamun tomb was constructed from granite and each corner of its parts contains protective gods like Isis, Serket, and Neith. Three mummification coffins were used for the body of the king’s mummy that was adorned with a golden mask. There was also a treasury room that contained around 5000-cataloged objects in addition to the king’s elaborate canopic chest and a large statue of Anubis. Everything was normal about Tutankhamun tomb until the incident of opening his tomb by the archeologist Howard Carter in 1922 with his team. What really happened there? Did they actually see a ghost of Tutankhamun? Alternatively, was there a real Pharaohs’ curse that caused the death of many people among Howard’s team? To answer these questions we have to start from the moment of opening the tomb by Howard Carter who was financed by George Herbert. After opening the tomb, some strange deaths among the excavation team happened and 11 persons died for different reasons. George Herbert was the one who financed the excavation team. He died on 5 April 1923, 4 months and 4 days after the opening of the tomb. Howard Carter was the main one responsible for the opening of Tutankhamun tomb. He died because of some complications from Hodgkin’s Disease on 2 March 1939. A. C. Mace died because of arsenic poisoning. Sir Archibald Douglas-Reid died from a mysterious illness on 15 January 1924. Finally, King Tutankhamun has lots of majestic treasures in the Egyptian museum beside to his fabulous monuments in Luxor, so with our Egypt tour packages will make you able to witness these historical artifacts of King Tutankhamun in addition to exploring the archaeological sites of Pharaohs in Cairo, Luxor & Aswan.